I went to my first one-to-one class to learn the mac computer this morning. It was great. My personal trainer, Katie, also likes to knit and crochet so we swapped web sites. I showed her my ravelry page and she showed me her stuff on craftster.org. She gave me some tips on Rick’s presentation, but I think he should have his own trainer. I like to chat too much and get off topic too easily. I did find out about scratch drives and backup drives. I use the same drive for both purposes on our PC, which isn’t a good idea for a mac. So we need another drive. The advances in computing amaze me. I learned so much today and in a week I have a class set up to learn the short-cut keys. After class I went to the Lupicia tea shop. Every New Year in Japan there is a custom where shops fill grab bags with mystery contents and sell them for a substantial discount. I bought the last big happy bag left in the shop. It had a tea pot in it that is usually the price of the bag, so all the tea was basically free. 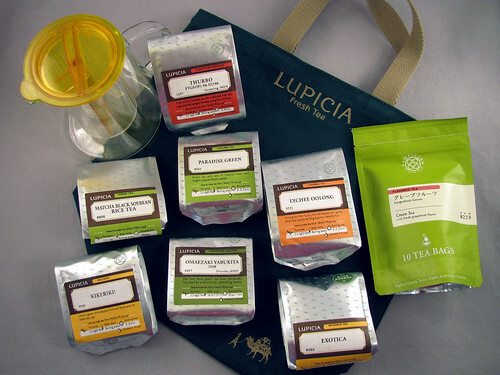 Lupicia teas are wonderful. They can usually be steeped more than once without loss of flavor. They have so many varieties that I keep a tea journal recording all the new teas I try. Tea and knitting go so nicely together. I always have a mug next to me when I work. It is relaxing to pause and warm my hands between rows. This entry was posted on Monday, January 5th, 2009 at 3:00 am and is filed under Life. Tagged: Life. You can feed this entry. You can leave a response, or trackback from your own site.